The mists of Avalon call you to Glory! But the Lady of the Lake gives you not a sword as expected, but some high value Free Spins and Wilds in this Avalon mobile slot. Arthurian legends aside, who doesn’t love it when online slot machines give you big multipliers during free spin features? Microgaming’s Avalon slot holds many secrets and treasures, the biggest one being the lady herself who will give you 12 free spins with the possibility of a hefty 7 times multiplier. Generally when we hit the bonus feature, we rarely get less than a 4x multiplier, and have hit the 7x multiplier enough time to know it’s not a mystical holy grail. Not to mention that this Avalon slot has given us some fairly decent tidy sums in the past. During the free spin games you get not one, but two possible wild icons, increasing your chances of winning significantly. Not always guaranteed of course, but the thrill of hitting a five of a kind during the free spins is always real. The graphics are fairly old fashioned, but still beautiful in our eyes. The lovely mythological sound effects are a nice touch and easily transport you into a far away world when playing on your iPad or smartphone. Best of all, the max jackpot amount is a hefty 105,000 in cash, an above average amount for a mobile slot machine. Not just that, but the reported payout rate is 97% – which is perfect for a low to medium volatile slot. With a betting range of a 0.01 up to 100, Avalon is a mobile slot for beginners and experienced players alike. A classic Microgaming slot that just seems to gets better with age. Wild Symbol: Treasure Chest wild symbol will only feature during the free spin rounds, but will double your winnings. The beautiful Avalon Castle Wild, however, will show up anytime and anywhere and equally has a 2x multiplying effect. Scatter and Free Spins: If you get 3, 4 or 5 of the aforementioned Lady of the Lake symobls she will grant you 12 free spins and anything between 2x and 7x multiplier, with the possibility of more free spins being re-triggered. Gamble Feature: Risk it all with a double or quadruple or nothing game of cards. Guess the colour and/or the right suit of the hidden card to increase your winnings significantly. 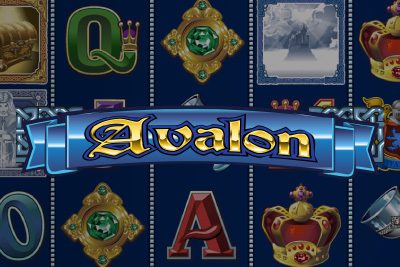 This Avalon slot game is an often overlooked Microgaming slot, losing out to its more better known brothers and sisters, it should find it’s place of pride in any mobile slots players favourites list. Great jackpot, fantastic free spins, multipliers and wilds to go wild about, we highly recommend you play this mobile slot machine.